The Credit Management Database is not just a great way to organize and manage your credit accounts; you will be informed of your current balances and minimum payments due on each of your accounts (credit cards, mortgage, student loans and auto loans). The database is equipped with bill reminders, so you will never have to worry about paying your bills late. 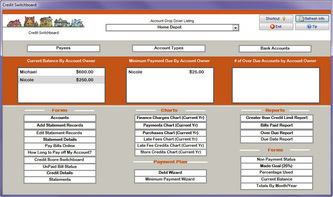 Also included are payment calculators, reports, comparison charts and forms. An financial organizer for your bills with reminders, reports and charts. ...... Also included are payment calculators, reports, comparison charts and forms. Payment Calculators: Calculators to help you manage and eliminate debt. Qweas is providing links to Credit Management Database 3.0 as a courtesy, and makes no representations regarding Credit Management Database or any other applications or any information related thereto. Any questions, complaints or claims regarding this application Credit Management Database 3.0 must be directed to the appropriate software vendor. You may click the publisher link of Credit Management Database on the top of this page to get more details about the vendor.